We are delighted to launch this new six day Tour which is based at the excellently situated and lovely Novotel Gent Centrum. 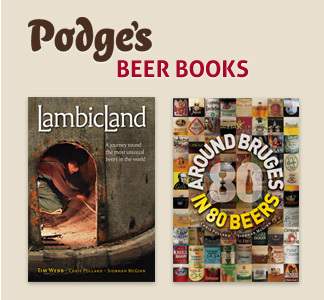 Ghent is one of the top beer destinations anywhere in Europe, just have a look at Podge's Ghent Bar Guide with over 100 hand-picked entries! On this Tour we will be exploring beer, breweries, cafes and beer-cuisine restaurants alongside the coast, rivers, canals, lakes and waterways of Belgium. We will be including in the Tour a day travelling on the brilliant coastal tram and fit in no less than three boat cruises with beer on board plus sampling the best of Belgian beer in high summer. Het Waterhuis aan de Bierkant, Ghent, one of the city's many great beer bars. 05.15hr Coach pick up at bus shelter outside Crown House, Crown Street, Ipswich, Suffolk IP1 3HS (opposite NCP Car Park). 05.45hr Coach pick up at Chapel St South Layby Southway, Colchester, Essex CO2 7BA. 06.15hr Coach pick up at The Woolpack, Mildmay Road, Chelmsford, Essex CM2 0DN. 06.50hr Coach pick up at Esso Dartford Service Station, 474 Princes Rd, Dartford, Kent DA1 1YT. 07.50hr Coach pick up at Premier Inn, Eureka Leisure Park, Rutherford Road, Ashford, Kent TN25 4BN. 08.00hr Coach pick up at Stop24 J11 M20 near Folkestone, Kent CT21 4BL. 08.10hr Coach pick up at Dover Ferry Terminal, Kent CT16 1JA. 09.25hr P & O ferry sailing from Dover. 12.30hr Our first stop is at the lovely Belgian seaside resort of St Idesbald. We will make our way to the Zeedijk (the Seaside Promenade) to the lovely cafe restaurant Bière sur Mer (Beer-on-the-Sea!). They have an impressive beers list of 118 choices with eight on draught. They have bottles from Brunehaut, Strubbe, Leroy, De Bie, De Ranke, Boon, Het Anker and Saint Feullien breweries. The local St Idesbald beers served here are brewed by Brouwerij Huyghe in Melle. Here we will have our first pre-arranged group meal and a crack at their great beer list. 15.15hr Leave Bière sur Mer, St Idesbald for the journey up the coast to Nieuwpoort. 16.00hr Nieuwpoort is the only natural port on the Belgian coast and this tidal port is situated at the mouth of the Yser River. Due to the rising popularity of water sports Nieuwpoort marina has become the largest marina on the North European coast. We will have a one-hour cruise taking in the impressive Euro-Marina and yachts. Hopefully we will catch sight of the harbour seals which increasingly bask on the concrete slipways here. There are signs up (in Flemish) which request visitors not to annoy the seals! We will cruise around the famous ‘Goosefoot’ lock complex sailing past the impressive King Albert I Memorial constructed after the First World War by grateful veterans in praise of their ‘Soldier-King’. We also pass the Ysermonding Nature Reserve where the salt water of the sea meets the fresh water of the Ijzer River. 17.30hr Leave Nieuwpoort for the journey to our base for the next five nights, the beautiful Flemish city of Ghent. 18.15hr Arrive at Novotel Gent Centrum and check in. 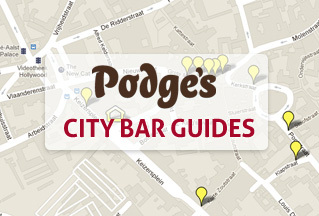 Travellers have a free evening exploring the bars and cafes of the city armed with a Podge’s Ghent City Bar Guide and Map* copies of which will be distributed on Tour. Ghent is an amazing city for beer cafes as you will see and Podge’s Ghent Bar Guide on google maps contains a whopping 111 entries, but we’ll be suppling you with an edited printed, more manageable version covering the central city bars. 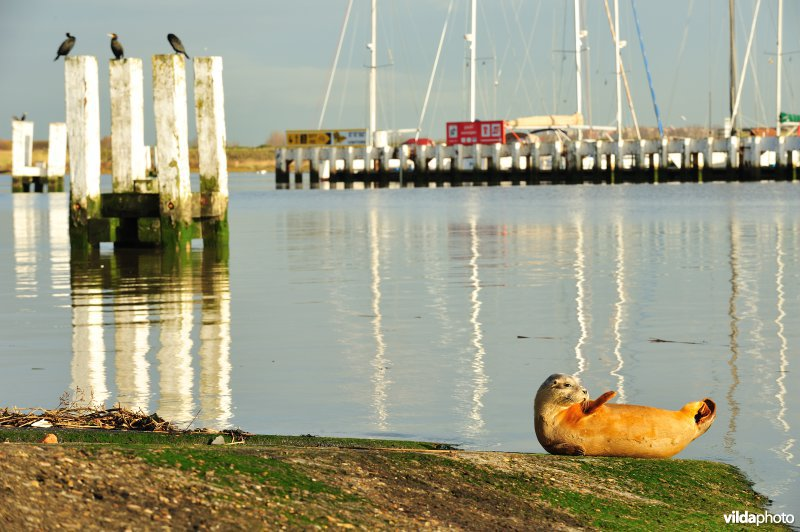 A harbour seal in Nieuwpoort Yacht Marina - hopefully we'll see one on our harbour cruise. 10.00hr Following a superb buffet breakfast we head off by coach from Novotel Centrum, Ghent. 10.50hr Arrive at a bar called Emile V in St Amands. This is a beer café with a beautiful terrace overlooking what looks like a lake but is in fact a large bend in the River Schelde (Fr. Escaut) as it grows bigger on its way to Antwerp and the North Sea. The River Schelde is 220 miles long and starts in the Aisne department of north France and runs north east through Belgium. At Ghent the Schelde is joined by one of its main tributaries the River Leie and here the Scheldt turns east towards Antwerp from where it runs into the Netherlands and eventually the North Sea. In front of this café overlooking the river is a statue of Symbolist poet and artist, Emile Verhaeren, a prominent figure in Belgian literature and art who was born here in St Amands. He was famous for his huge moustache which you can see on the statue and he is holding a copy of his poems out towards the river which he loved. This café is named after Emile and has a list of 180 beers. 12.20hr Leave St Amands and travel towards the great city of Antwerp. 13.00hr Arrive at Antwerp docks to the north of the city. Our the coach will drop us at Londenbrug (London bridge) outside a café called the Licht ter Dokken (The Light of the Docks) where we will meet the boat for our Jan Plezir Port Cruise* which departs at 13.35hr. 13.35hr The cruise company say that if you drank coffee this morning, the chances are it came into Europe via Antwerp port. Antwerp is Europe's second-largest seaport after Rotterdam. On this cruise we are shown the busy and fascinating port of Antwerp and the sea-bound and inland waterway traffic. You will see the impressive islet with the new port house, the ultra-modern system of handling of containers, ship repair companies in action and the enigmatically named ‘fruit terminals’. During the cruise you can hire for a small fee an extra audio-visual guide on the operation of the port of Antwerp. Of course, the boat has a bar on board and serves Antwerp's own Bootje Bier (Boat Beer) brewed by Antwerpse Brouw Compagnie, where we are headed next. 15.05hr Disembark the Jan Plezir boat. On disembarkation we walk three minutes to the Antwerpse Brouw Compagnie (ABC) who have installed a fancy new brewery close to the old Red Star Line Atlantic passenger company which had its headquarters here. They took passengers from Europe to America. Their former warehouses have recently been reopened as a museum and we will probably be able to see the weird new building at the museum which looks a bit like a fan heater. Einstein was a Red Star passenger, escaping the Nazis and so was Vito Corleone in Godfather III. Seef 6.5%abv. The flagship beer and a revival of a historical beer style of Antwerp dating back to the 17th century which used to be brewed by dozens of breweries. This beer style disappeared during the First World War. It is brewed to an old recipe with buckwheat and oats – a tricky cereal to brew with. Bootje Beer 7%abv. A homage to the Red Star Line. Nonkel Pater (Uncle Pater). This is a 9%abv dark dubbel beer. Super Cadix 5.6%abv. A dry hopped low fermentation lager. Crowdfunders 8.5%abv. A strong blond beer. Tournée Antwerp 6.5%abv. A fresh blond beer. Hussy 6.5%abv. A limited-edition blond. Xperimental 6.5%abv. A limited-edition wood-aged Seef beer. Here we will have a tour of the brewery* and a taste of their beer*, after which we can relax in their smart taproom situated in the middle of the brewing hall with views of the fermentation tanks. We will also have a pre-arranged meal at the brewery. 17.45hr Leave Antwerpse Brouw Compagnie, Antwerp. 18.30hr Arrive at and drop at Novotel Centrum, Ghent. 10.30hr Arrive at the Donkmeer lake, east of Ghent. This is a large expanse of water surrounded by bars, boat hire and eel restaurants. Eel-eating is a big thing here. It is also a nature reserve and tourist and cycling spot. This lake used to be a bend in the River Schelde in an area rich in peat which was largely extracted in the nineteenth century for fuel. The resulting holes from this peat extraction became water-filled and the area was planted with poplars for matchmaking. The Donkmeer is the largest lake. We will make our way to the north side of the lake and the coach will drop off outside the Zoetemeer Café restaurant where you can go in for a drink or walk around and explore the lake and its bars. Look out for the tasty looking Eel (Paling) in a Green Sauce (Chervil). 12.00hr Leave the Zoetemeer Café, Donkmeer. 12.20hr Make our way to a village called Hamme and we may have time to stop off at the Bierhove beer café which has an extensive beer list. We will then go to the lovely Watermolen café restaurant nearby also in Hamme and there is just a couple of minutes between the two cafes. 13.30hr Arrive at the Watermolen or Watermill cafe in Hamme. This is a beautiful café in a quirky three storey building which presumably was once a water mill situated on a waterway called the Oude Durme. This is a tributary of the River Schelde which is now separated from the main Durme waterway, like an ox-bow lake. Here we will have our pre-arranged meal and a beer or two. 16.00hr Leave the Watermolen at Hamme. 16.30hr Arrive at De Planck, a huge café boat moored in the southern part of Ghent city on the banks of the River Schelde. The Plank is a lovely, cosy refurbished barge with several decks and comfy seats and cushions down below and a lovely top deck too from where to view the moorhens. It is known for its extensive beer list of more than 200 choices and they have a house beer called Planckske. Watch out for the ship’s tabby cat. 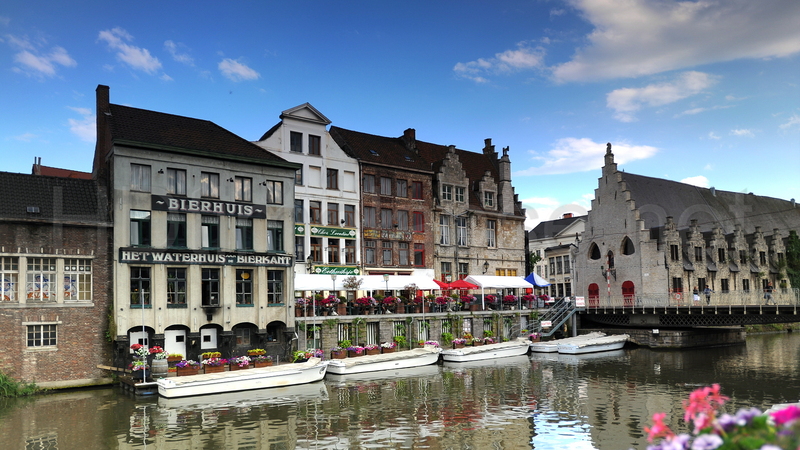 Look at our bar guide to Ghent to see what he got up to last time we were here. 18.30hr Our Ghent city cruise* takes us on the River Leie and the Lieve and we pass some of the great sights of the city. The high spot being cruising below the Castle of the Counts (The Gravensteen), a textbook Hollywood castle. We will have a beer on board, the city beer Gulden Draak* (Golden Dragon) named after the gold (actually he's copper) dragon perched atop the belfry near our hotel. Gulden Draak in its distinctive white dumpy bottle is brewed at nearby Ertevelde by Brewery Van Steenberge and is a luscious strong dark beer. 19.40hr Disembark at Graslei in the city centre for an evening at leisure in the city. 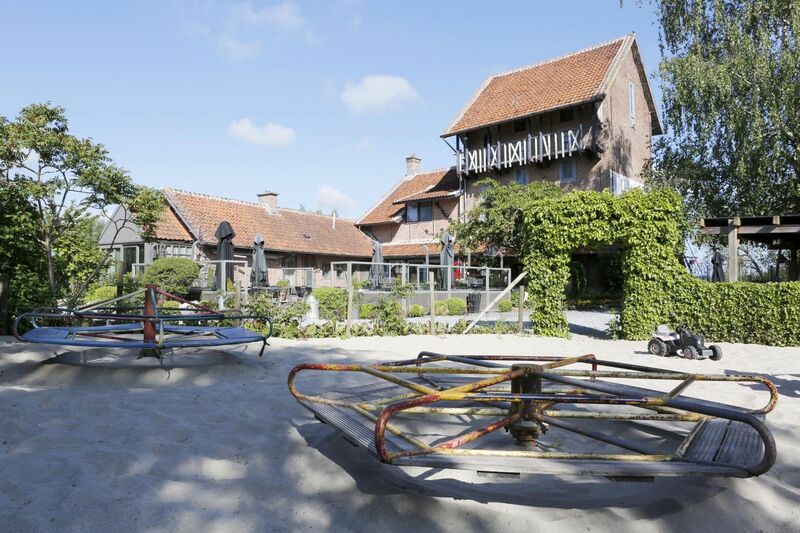 10.30hr Arrive at the picturesque Sashuis at Astene, a famous café-Bar-Museum situated on the River Leie. This river (Fr. Lys) is 125 miles long and runs north-east from its source in Pas-de-Calais France all the way to Ghent where it flows into the River Schelde. This pretty café only opens on a Saturday and Sunday but should be bustling in summer especially as it has a front terrace onto the river. The café is opposite one of those green meccano road bridges over the river and is the raison d’etre for this building. Sashuis translates as lock house. This café-museum is housed in a building dating from 1862 which was the lock master’s house, the man responsible for the hand-operated bridge. The cafe houses a collection of inland and maritime shipping artefacts, documents and paintings from the time of the height of the shipping trade here in the nineteenth century. The café beer list includes beers from Verzet and Viven and they also have a blond house beer called Schobiak. The owner, Wim, would like to show us round on our arrival. 12.00hr Leave the Sashuis at Astene. 12.45hr Arrive at the Oud Brughuys (The Old Bridge House) in Berlare. This is a pretty three storied bright yellow café on the River Schelde. This waterside café has a beer list of 50 choices for you to ponder over and perhaps chose one. Or two. 14.15hr Leave the Oud Brughuys at Berlare and make our way back to Ghent for an afternoon at the new place-to-be, the Dok Noord or the North Dockland. This old industrial area has been Ghentrified and old factory buildings have been turned into cafes, restaurants, organic bakeries and pop-up summer beach bars complete with deck chairs. 14.45hr Arrive at the Joint Dokkaffee Joint Dokkaffee at Dok Noord Ghent which is a boat café and restaurant with over 30 beers on board. Here we will have a group pre-arranged barbecue on board, hopefully on deck, and a beer or two. 17.10hr Leave Joint Dokkaffee for the short walk to the Dok Brewing Company. This brewery only opened in May 2018 at Hall 16 which was an industrial transformer hall converted into a brew-pub complete with chandeliers and a sun terrace. The core movers behind this project are Dimitri Messiaen who used to run the smallest pub in Ghent - the Galgenhuis - and who was behind the invention of Ghent Pils 13 which you will see a lot of around town. 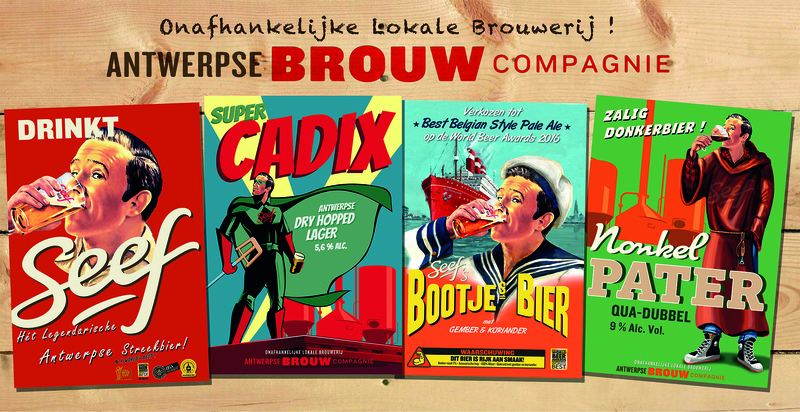 Another partner is Janos De Baets who used to work with Proef Brewery in Lochristi and who brews Hedonis beers including Ouwen Duiker (the beer label is a deep-sea diver but the beer name is colloquial for ‘Old Perv’). The brewing kit was custom made and assembled in South Africa and shipped to Ghent in a container a few months ago. They have installed 30 taps in the brewery tap and they aim to avoid selling any of the big brand lagers which dominate the Belgian market, but will offer quality beers from passionate brewers like themselves. They have mobilised a huge investment, have big plans and want to take the unusual step of installing a canning line next. 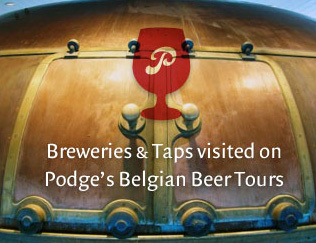 We will have a brewery tour* and a taste of their beer*. 19.30hrish Drop at Novotel Centrum, Ghent. The new Dok Noord in Ghent - cafes, beer and water! 10.00hr Following a superb buffet breakfast in our hotel we head off by coach for a day on the brilliant Belgian Coastal Tram which at 42 miles in length is the longest tram line in the world. 11.00hr Arrive at the Kursaal Casino and theatre/music venue on the corner of Westhelling and Van Iseghemlaan, Oostende. This is also where we will pick up with the coach in the evening and will be marked on your map. We will walk the short distance to the main central Oostende tram stop, the pretty Marie-Joséplein. Here we will obtain a day tram pass* for each traveller and you have the day free to travel on this fantastic coastal tramway. This tram stop marks just about the middle of the whole tram system. You are free to travel the complete length from the French border in the west as the border with the Netherlands in the east but this does take about two and a half hours, so bear this in mind when planning your day and you may want to build in time for a meal. We recommend sauntering along the line from Oostende to De Panne on the French border and back to Oostende. This ‘western’ half is much more heavily populated with bars and restaurants than the ‘eastern’ half and travellers will be provided with bar guides* for the best places for a beer (and food) along this western half of the tramway, all of which venues have been visited by Podge & Siobhan in the name of research over several hot summers! A tram map with all 69 stops will be provided to travellers. In the summer season coastal trams run every 10 minutes. 21.00hr Coach pick up outside the Kursaal Casino, Oostende where we were dropped off in the morning. 21.50hr Arrive and drop at Novotel Centrum, Ghent. 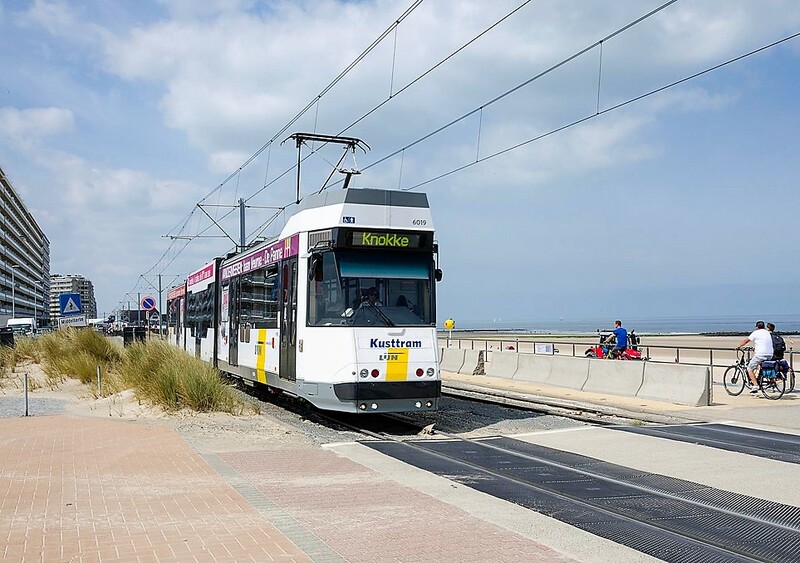 The Coastal Tram in Belgium - a great day out. 10.00hr Check out of Novotel Centrum Ghent and head off by coach to our beer warehouse stop. 10.20hr Pay a visit to our friend Dominiek Geers and his family, the fifth generation to sell beer in this village. The Geers family own the great drinks warehouse Dranken Geers in Oostakker near Ghent. 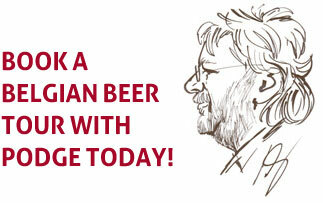 Here we have an opportunity to buy beers to take home from their stock of hundreds of quality Belgian and foreign beers. They do take credit cards. 11.20hr Leave Dranken Geers in Oostakker. 12.00hr Arrive at the excellent Taverne Welkom at Hoek which is just beyond Damme north of Bruges and very near the border with the Netherlands. This tavern is on the Damme Canal which starts in the ancient town of Sluis and joins the Leopold Canal running north-east to the port of Zeebrugge. The Leopold Canal was finished in 1850 after Belgium's independence from the Netherlands in order to circumvent the Dutch blocking Belgian discharge of water from the polder land. Here Geert runs a hotel which also happens to be a brilliant beer bar. They have a stunning 130 beers with loads of quality picks on the menu. By the way, this area of creeks is known as the meetjesland or land of the old women. Legend goes that it gets its name from the voracious sexual appetite of Emperor Charles V. Apparently when he travelled through this region the local people hid their daughters and young women causing the emperor to believe that the area was full of old women or ‘meetjes’. 13.30hr Leave Taverne Welkom at Hoek. 14.00hr Arrive at one of our absolute favourites in Belgium Bistro Nieuwege at Varsenare. This pretty waterside café is on the banks of the Ghent-Brugge-Oostende canal which connects the North Sea to the Belgian interior and which was completed as early as 1623. This lovely café is a West Flanders gem run by the friendly Didier, Sofie, Jim & Jay. Their beer list is staggering and runs to a whopping 126 choices. We find it hard to tear our travellers and ourselves away from this place and Didier is bound to have something refreshing on draught for us, or you could go for something from his selection of De Struise Brouwers beers. Here we will have our pre-arranged meal and a beer or two before the journey back to Blighty. 17.30hr Leave Bistro Nieuwege at Varsenare. 18.55hr Arrive Calais Ferry Terminal. 19.55hr P&O Ferry Crossing from Calais. 20.25hr Arrive Dover Ferry Terminal, Kent CT16 1JA. 20.30hr Coach drop at Dover Ferry Terminal, Kent CT16 1JA. 20.55hr	Coach drop at Stop24 J11 M20 near Folkestone, Kent CT21 4BL. 21.15hr Coach drop at Premier Inn, Eureka Leisure Park, Rutherford Road, Ashford, Kent TN25 4BN. 22.00hr Coach drop at Dartford Railway Station, Kent DA1 1BP. 23.35hr Coach drop at 102 Mildmay Road, Chelmsford, Essex CM2 0EA. 24.30hr Coach drop at bus shelter outside Crown House, Crown Street, Ipswich, Suffolk IP1 3HS (opposite NCP Car Park). If you are travelling alone and want to share a room with another traveller please contact Podge as we are regularly able to pair up travellers in twin rooms to avoid the need for payments of Single Supplements.